David Jones has become our new vice-chairman and we welcome 3 new committee members to the fold, Mark & Becky Devereux and David Turner. The full committee is as follows: Nick Saunders (chairman & membership); David Jones (vice-chairman); Jeanne Jones (secretary); Margaret Atkins (treasurer); Colin Atkins (fundraiser); Steve Gazzard (press officer); Mark & Becky Devereux and David Turner. Membership is still £5 per season and is open to all. ‘You don’t have to have a disability to join us’. * Inclusion in the ECFC Priority Group’s database. * Limited edition button badge (new members). * Discount on official coach travel where advertised (discount may vary). As stated above, all our members are included on the ECFC Priority Group database, this lets you buy tickets when the football club sells tickets to priority group members only and before they go on general sale. We are a recognised supporters group with the club. City defender, Billy Jones has kindly agreed to become our new President. We all welcome Billy’s arrival and we all look forward to working with him in promoting what we do. Bertie Cozic was our first ever President and he held the position for 4 years but sadly Bertie left at the end of last season, we wish Bertie all the very best for the future and thanks for being a great president over the years. We’ve done a great deal with the football club and we’re now Billy Jones training kit sponsors for the season 2011/12. Plans are in place for our 2011 Christmas draw and tickets will be on sale from October, tickets are priced at £1 each. We’ve are starting selling tickets early because there are not that many Exeter City home games coming up in November. Our top prize is from The Grange garage of Exeter link. 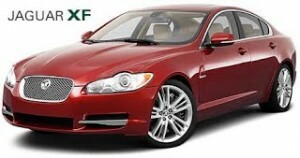 They’ve very kindly donated a use of a Jaguar XF car for a weekend. Conditions do apply: 1 – Driver must be 30 years or older; 2 – Driver must have a clean driver’s licence; 3 – 120 miles per day allowance. Last season Exeter City kindly gave us the opportunity of a bucket collection, we raised a great amount and with this money we’ve been able to buy two Radar key locking systems, one has now been fitted to the disabled toilet inside the stadium and the other one is being fitted to the downstairs disabled toilet inside ‘the park’ (centre spot). The club have offered us another collection for this season and this will take place at the AFC Bournemouth match on Saturday 17th September and every penny raised will help towards improving or adding to the football clubs disabled facilities. This is now under the wing of ECDSA on behalf of Exeter City F.C. We have a waiting list for when spaces become available, if a disabled supporter (blue badge holder) would like their name added to the waiting list, please email your details to: ecfcdsa@gmail.com and hopefully we’ll be able to allocate you a space at a future match. We’ve updated our logo and have added the motto “A voice to be heard” as this is what we are all about. A group of Exeter City disabled supporters and their assistants were welcomed as guests of Sheffield United during the recent match between the two teams. The hospitality was arranged by the Sheffield United Disabled Supporters Association, and we met up with some of their members before the match. We were then taken to the executive box that we shared with them, where we were given refreshments before enjoying an excellent view of the match. We all had a very enjoyable day and the two teams even contributed to our enjoyment by treating us to a really exciting game. 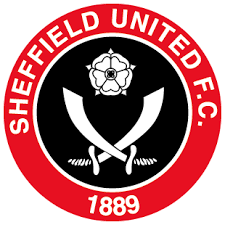 We would like to extend our grateful thanks to Sheffield United for their generous hospitality, and to the members of their DSA who made us so welcome. We look forward to meeting up with them again when we play them at home later in the season. Bucket collection took place at the AFC Bournemouth match on Sat 17th Sept 2011. We’ve been able to raise a very nice sum of £373.58. This is a fantastic amount and all made possible by the generosity of those who attended the match and our bucket collectors. 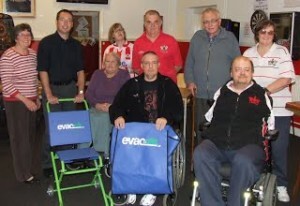 This has allowed us to buy 2 evacuation chairs for our football club and was presented to Andy Gillard – ECFC Operations Manager by our committee. Everyone here at ECDSA would like to thank every single person who very kindly helped us with the collection. Members from these supporters groups helped and supported our collection: East Devon Grecians, North Devon Grecians, Exec-100 Club and our own members. Also thanks to the Supporters Trust (Andy Cole – Trust Chairman) on behalf of the football club for again giving us the opportunity of a bucket collection. Thanks again to everyone for your support and help. Our Christmas Draw took place on 14th December 2011. We made a profit of just under £1,200.00 which will be held for future requirements for improving facilities at St James Park for disabled supporters. We would like to thank all those who have supported us both in purchasing draw tickets and those who helped in the sale of them as well. All winners have been contacted. 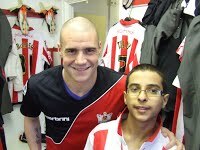 Exeter City Disabled Supporters Association showed their support for the Level Playing Field campaign by sponsoring a child to become a matchday mascot. 14-year-old Yazeed, who is autistic and attends Dawlish School, led the Grecians out along with Steve Tully at the Preston game. He was joined in the stands by his two younger brothers Ebaraheem and Abdulaziz. Exeter City’s One Game One Community Group (OGOC) works closely with ECDSA on disability issues and has helped choose Yazeed as a mascot through one of its partner community groups. LPF campaigns to improve facilities/services so that all clubs offer the same kind of match day experience for disabled fans as non-disabled ones. LPF is keen to highlight that football plays a massive part in the everyday lives of disabled supporters. Article taken from the Exeter City Football Club official website. For more details on the facilities and the football training for supporters with disabilities at Exeter City please visit our ECFC Disability Information and Disability Football sections on this website. We gave out our first every award to the Exeter City player who in our eyes was the most improved player at the end of the 2008/09 season. Past winners of the award that are still at the Club are Liam Sercombe (2009/10) & James Dunne (2010/11). Members have been voting again for this season’s winner and the award goes to a young player who has made a refreshing mark on the first team. Congratulations ‘Scot’ from everyone at ECDSA. Award presented to Scot by Nick Saunders (chair), David Jones (vice chair) and Jeanne Jones (secretary) at the Exeter City end of season gala. Trophies were kindly sponsored by committee member Steve Gazzard. Hello & welcome to this the 5th Annual General Meeting of the Exeter City Disabled Supporters Association and the following is my Chairman’s report. For the 5th year running our association’s membership has grown. As I stated at last year’s AGM, our aim is to get too that magic 100 mark. If every member could encourage someone to join ECDSA, we would get there. In the past year we’ve been working hard in building strong ties with other supporter groups. We already have good ties with some supporters groups, namely the Supporters Club, East and North Devon Grecians. We now have ties with One game, One community as disability is included in their campaign and as we’re the clubs main disability group they wanted to work with us, which we gladly accepted. We also have ties with the Supporters Trust and copies of our minutes of meetings are sent to them. Working with these other groups, in my view, makes us stronger as a group. Making these ties has been made easier by the re-launch of the Grecian Group Forums by the Supporters Trust in the past season. I’m always hearing the words ‘ECDSA are leading the way’. We are finding that more and more clubs are setting up disabled supporter associations’. People within Level Playing Field are telling other clubs about the great work we continue to do for our football club and disabled supporters, all through a hard working group of supporters and all with limited funds. Only a month ago I had a call from the disabled supporters representative from Wolverhampton Wonderers asking about the work we do as they’ve heard good things about us from LPF, they are looking into setting up their own disabled supporters association. We all should be very proud of our achievements. 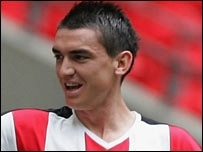 July 2011: ECFC Disabled & Assistant Information: We continue to send this information to other clubs. We do this via email to save on cost. Radar Key locking system: We had a system installed to the disabled toilet door within the stadium, key being left with the steward. More details from our Treasurer coming up very soon. August 2011: ECDSA President: Billy Jones became our President due to Bertie Cozic leaving the club; we would like to thank Billy for his support of ECDSA over the past season. We sponsored his training kit as our president and now have a signed training shirt from Billy, as part of our sponsorship package with the club. 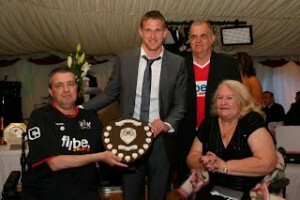 ECFC Ability Counts: We sponsored them again last season. November 2011: Radar Key locking system: We had another system installed, this time to the disabled toilet downstairs in The Park, with the key being left behind the Centre Spot bar. SWDFEF: The first ever South West Disabled Fan’s Experience Forum was held here at Exeter City. I had this idea in my head for some years whereby representatives for disabled fans from the Southwest football clubs could exchange views, policies and practices concerning their clubs and associations. This would assist all attendees in their efforts to improve their own club’s disabled facilities. I finally got to work on this idea by pitching it to David Munn of the Yeovil Town DSA, with his help the first forum was held in November. I would like to thank Exeter City for allowing the first forum to take place here at Exeter City and for the free use of the facilities. Latest news on the forum is that the Football League are interested in the idea and are hopeful that similar forums could be setup in other parts of the country and the next forum will be held at Yeovil Town on the 18th October. Evacuation Chairs: Used all money raised from a bucket collect to buy two evacuation chairs for upstairs in The Park. December 2011: Christmas draw: This was again a great success. Thanks to Colin & Margaret for sorting out the draw and for their hard work and to Billy Jones in doing the draw on our behalf. February 2012: Wheelchair for hire: The manual wheelchair we bought the club last year got damaged, however we got this repaired and decided to buy another one for the club. This gives the club two wheelchairs for hire and these chairs can be used by anyone who has a short term disability and are in need of a wheelchair. There is no charge but we do welcome any donations. April – May 2012: Most Improved Player of the Year: Members voted again for this season’s winner and the award went to a young player who had made a refreshing mark on the first team. It was with great pleasure to announce that the winner was Scot Bennett. The award was presented to Scot at the clubs end of season gala ball by myself, David and Jeanne Jones. Our award was kindly sponsored by committee member Steve Gazzard for the 4th year running, thanks Steve. New for next season: 50/50 half-time result boards: We’re bringing back these boards so that the result of the draw can be seen by those supporters with a hearing impairment. We know of some supporters who would buy tickets but haven’t been doing so because they’re unable to hear the result of the draw. The draw is run by the Supporters Club and we are hopeful that those supporters who haven’t been buying tickets will now start buying them again. Last season Exeter City didn’t have a resident Disability Liaison Officer because when the DLO position I held was handed to Jon Underhill, ECFC Stadium manager at the time, Jon left the club shortly afterwards. Andy Gillard and Clive Pring jointly took up the role on top of their other duties at the club. After a year off, I’m glad to say that I’ve been reappointed the clubs DLO as a volunteer and I must say ‘I’ve missed it’. If supporters with disabilities have any problems they can still contact us here at ECDSA and the problem will be dealt with, with the utmost urgency, ether by ECDSA or myself as the clubs DLO. I intend to stay on as your Chairman and if re-appointed I will ensure that we continue to help and support Exeter City Football Club in any way possible by adding or improving the disabled facilities and that all disabled supporters and their personal assistants are treated fairly, as you would expect. Finally, I would like to thank our committee members for all their hard work and time given for the benefit of our membership and Exeter City over the past season, our members for their continued support and to Exeter City Football Club for allowing us to use their facilities for free for our meetings and to all of you for attending this years AGM. Thank you all for coming along this evening and thank you for listening!